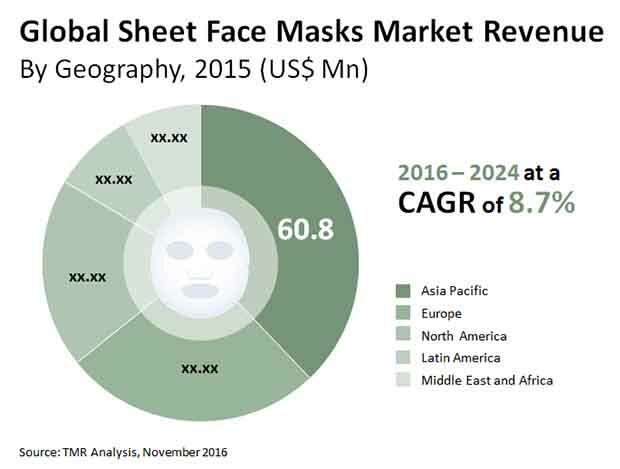 The global sheet face masks market is dominated by players such as Boss Biological technique Ltd., 3Lab Inc., Innisfree Corporation, Yunos Co. Ltd., DECLÉOR Paris, BioRepublic Skin Care, Dolce & Gabbana S.r.l., Sephora Inc., Kracie Holdings Ltd., and Star Skin Beauty Group AG. Consistent technological innovation is likely to pay dividends in the global sheet face masks market in the coming years, as the launch of innovative products has been key in the steady growth trajectory of the sheet face masks market. The steady growth of the consumer demographic in emerging Asia Pacific economies is likely to aid market players situated in the region. Western players could also make use of the lucrative opportunities in the Asia Pacific sheet face masks market, as significant scope also exists for collaboration. According to Transparency Market Research, the global sheet face masks market is likely to rise to a valuation of US$336.7 mn by the end of 2024. The market was valued at US$160.4 mn in 2015 and is expected to exhibit a robust 8.7% CAGR between 2016 and 2024. The key product types in the global sheet face masks market are hydrogel, bio-cellulose, non-woven, and cotton. Of these, hydrogel and bio-cellulose sheet face masks are the leading segments of the global market. The demand for bio-cellulose sheet face masks is likely to rise steadily in the coming years due to the growing awareness about its suitability to the task as a natural fiber. The comfort provided by bio-cellulose face masks has driven their demand among consumers, while their cheap production costs have made them popular among manufacturers, ensuring their dominance in the global sheet face masks in the coming years. Asia Pacific is the dominant regional market for sheet face masks due to the growing demand from populous economies such as India and China. As ASEAN countries exhibit rapid urbanization rates, they could also become important consumers in the Asia Pacific sheet face masks market in the coming years. Moreover, developing economies in the Middle East and Latin America are also likely to be key regional players in the global sheet face masks market in the coming years. One of the prime drivers for the global sheet face masks market is the rising threat of pollution in urban centers in developing cities. Due to rising industrialization and vehicle usage, air pollution has become a serious concern in many major cities in countries such as China, India, and Indonesia, and has had a tangible effect on skin health of the citizens. This has driven the demand for several cosmetic products, chief among them sheet face masks. While premium products in the global sheet face masks market sometimes remain out of reach for the average buyer in developing economies, the widespread demand for more economical product variants is likely to remain a key driver for the global sheet face masks market in the coming years. The increasing amount of attention being paid by the population to their appearance, and particularly to removing all signs of aging, has been a major driver for the global sheet face masks market. The high geriatric demographic in developed economies is thus a key factor likely to have a lasting impact on the global sheet face masks market’s future trajectory.